Author Sarah Sundin completes her Wings of the Nightingale series with a dramatic finish in In Perfect Time, a novel of love and redemption between two unlikely characters who fight against all odds to find love during World War Two. Through three years stationed in Italy, Lts. Kay Jobson and Roger Cooper have kept a steady cordial relationship. Kay, a beautiful flight nurse with a penchant for attracting attention, enjoys flirting and dancing, and dates many men for “fun.” Roger, a prankster pilot known for tardiness, is a former farm-boy who dislikes rules and regulations; he hopes to drum in a big-band after the war ends. With Kay’s flirtatious manner and Roger’s refusal to date, the two seem as likely to fall for each other as the Axis and Allies do of reaching a compromise. Nevertheless, Kay takes Roger’s rejection as a slight to her ability to get any man she wants. As Kay fights to understand what she has to do gain Roger’s attention, he struggles to trust himself with women—no easy task as Roger’s romantic past continually makes him question his decisions. Roger and Kay learn that it is only through God’s forgiveness and love that both of them can move forward from painful pasts. The timing of their potential relationship, however, is threatened by years of hurtful comments from family members that deepen minimal self-confidence in themselves and each other. Neither Kay nor Roger believes that they are good enough for God’s redemption or for the other person’s love. Dangerous missions across enemy territory thrust Kay and Roger into situations that grow their feelings for each other. The only question left is whether God’s forgiveness and the resulting redemption is enough for Kay and Roger to trust in His timing to bring them together. Sundin is a master of World War Two historical romance novels. 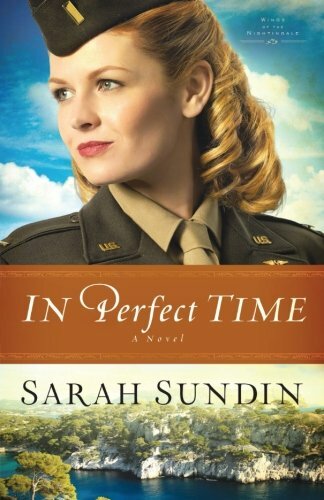 In Perfect Time is no exception to this statement—in fact, this novel may be her best yet as it spans multiple settings, utilizes a completely new plot line rarely discussed in World War Two novels, and threads in characters from her previous stories through the current characters’ experiences. From Italy, India, and France to the home-front across the United States, Sundin takes her readers to the front lines, behind enemy territory, through fields and towns with partisans, to USO tours. No setting is left untouched, and her vivid descriptions make it seem as if the war is currently taking place. Sundin’s attention to detail—especially to dialog, cultural standards, and heritage—display her love for World War Two history and her desire to bring love to light as a way of honoring those who valiantly fought abroad and at home during the war. One of Sundin’s tools for achieving this genuine love of the time period is her characters. In Perfect Time is filled with all the characters for a compelling story: the flirtatious vixen out to master men, the prankster running to escape his past, the brave boy fighting for his country, the sweet nurse awaiting her love…and many others who serve to complete the story of Kay and Roger’s love. Each character is one that readers can easily see amongst the streets and battlefields of World War Two. Sundin’s characters are completely and wholly human—relatable in a way that makes readers feel as if they could be the Roger, Kay, Georgie, Mellie, Vera, Mike, or Enrico of their own World War Two story. I bought Sundin’s Wings of Glory series as a whole; I pre-ordered the first two novels of the Wings of the Nightingale series; and had I not received In Perfect Time as an ARC I would have been the first person to my local Family Christian store to buy the novel. Sundin is one of my favorite authors, and I will continually anxiously await her future novels. In Perfect Time wins five-out-of-five stars for a stellar plot and relatable, loveable characters that readers will cheer for their deserved happy ending.